Google Maps on Android is about to get a lot more convenient: you’ll soon be able to find the cheapest gas around you and add detours to your route. Over the “next few weeks,” an update to the Android app will allow you to view gas stops along your route, including their price for regular-grade fuel, as well as how long much time the detour will add to your planned trip. Speaking of detours, you can now tap a magnifying glass icon at the top right corner of your screen to pull up a few floating action buttons for potential detours. By default, it lists the aforementioned gas stations, grocery stores, restaurants and coffee shops, but you can also find more places by typing a name or using voice commands. It’s a welcome feature that’s been a long time coming. 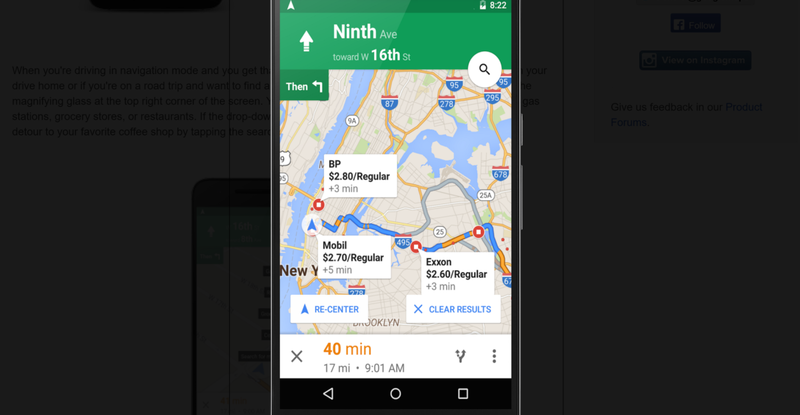 Finally, you won’t have to reset your navigation every time you make a last-minute stop — or if you just need a quick bathroom break — on your route. No word on iOS support yet, but we imagine it’ll come soon.